Forget eyes in the back of your head. Click here to play! You'll need eyes in your hands, your feet, on your eyelids. You'll need eyes everywhere watching all the time if you're going to live more than a few hours in the Zone of the Zombies. Back before the dead rose up, cities were open and numerous. Travel between them took maybe a few hours. Nowadays, if you aren't in the cities, you're dead, or about to be. If you must go into the Zone of the Zombies, though, here's some good advice. First of all, you gotta be a little crazy to wipe out hundreds of zombies, but you have to be careful you don’t go the whole hog and just snap. Next, remember that zombies bite, so zombie dogs are big trouble. If you can, travel in an armed and armored vehicle, with a shotgun, a baseball bat or chainsaw, and plenty of ammo and first aid. Traveling on foot for any distance is just asking to slip on an eyeball or get caught by a stray zombie arm as you are trying to outrun a horde of the undead. Still set on traveling through the Zone of the Zombies? Well, you could come out much richer if you make it back alive. With so much wealth abandoned out there, a brave and lucky survivor can make a killing from all the dead millionaires who abandoned their estates quickly. Good luck, traveler, and here's to your future fortune! 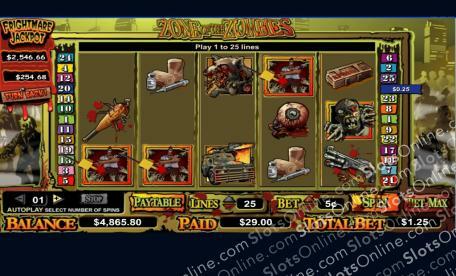 In the Zone of the Zombies slots, you take on the role of a survivor going up against the zombie hordes. Line up 5 zombies in your sights, and you'll hear the sound of clattering coins above the moans of the living dead. The Scattered Hero symbol pays out on the total bet, and when three or more land on the reels, it triggers the bonus game. The Zombie symbol is wild, and it can substitute for any symbol other than the Scattered Hero. The bonus game is triggered when 3 or more scatter symbols land on the reels. In the game, the player shoots zombies, and is awarded random prize amounts for each kill, with an additional prize awarded if the Hero makes it to the police station. The game ends when the Hero makes it to the police station or if the hero is attacked.